Shin Buddhism was initiated by Shinran (1173-1263) in Japan. His teaching was based in the Pure Land tradition as a successor to Honen (1133-1212). 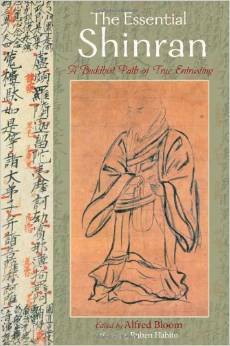 Shinran developed the teaching by maintaining that faith, endowed by Amida Buddha, assured enlightenment. All religious practices, particularly the recitation of the name of the Buddha, expressed gratitude rather than achieved purification. The institutions that evolved from his teaching are called Jodo Shinshu (True teaching/sect of the Pure Land [tradition]). The Nishi (West) Hongwanji and Higashi (East) Hongwanji are the largest bodies in this tradition. Rev. Patti Nakai of the Chicago Buddhist Temple looks at the controversial 35th Vow and offers a way to read it in the 21st century. Amida Buddha: The Buddha of Eternal Life and Infinite Light. The story of his attaining Buddhahood through completion of his 48 Primal Vows is narrated in the Larger Pure Land Sutra. Honen (1133-1212): Generally considered the founder of the independent Pure Land Sect through his Treatise on the Nembutsu of the Select Primal Vow (Senjaku-hongan-nembutsu-shu). Shinran was one of six disciples who continued the teaching after the master’s death. Honganji: Temple of the Primal Vow is one of the divisions of Jodo Shinshu. There are traditionally 10 branches of which the Honganji became the most dominant in Japan. It further divided into two branches, East and West. Jodo Shinshu: The term means True Teaching of the Pure Land (tradition). This term was appropriated by Shinran to denote his teaching in contrast to the other disciples of Honen. In the West, Shin Buddhism is commonly used. Larger Pure Land Sutra (Daimuryojukyo): Exists in four Chinese translations. It depicts the attainment of enlightenment and Buddhahood (Amida) by the Bodhisattva Dharmakara (Hozo), providing the foundational story for the popular Pure Land Tradition. Along with The Pure Land Meditation Sutra and the Smaller Pure Land Sutra, it is one of the three texts central to it. The Meditation Sutra (also known as the Contemplation Sutra) outlines various meditations used to achieve visions of the Pure Land and Amida and gives reason for stressing recitation of the Name in popular practice. The Smaller Sutra describes the Pure Land. Nembutsu: The term means “thinking on the Buddha.” Originally, it referred to meditation but in the Pure Land tradition it came to signify the recitation of the name of Amida Buddha, in Japanese, Namu Amida Butsu. When recited with sincere faith, it was regarded as an easy means to be reborn in the Pure Land for ordinary people who could not participate in monastic discipline. Pure Land (Jodo): A spiritual realm entered after death which, because of its absolute purity, assures that the devotee will attain Nirvana and Buddhahood. Recitation of the Name with faith brings about this birth. Buddhist Flag – The first five stripes of the flag are self colors of blue, yellow, red, white and light red. The sixth color is a combination of the five. The flag symbolizes the unity and harmony of Buddhists. Dharmacakra – Also known as the Wheel of Dharma. It is the symbol of Buddhism. The eight spokes represent the Noble Eightfold Path. The wheel symbolizes the wholeness as well as the flow of Buddha’s teaching. Hondo or Main Hall – The Hondo should be entered quietly and with due reverence; i.e., enter and leave with gassho facing the shrine. Nenju or Juzu – A collection of beads with three main beads strung together is used when in gassho at the time of worship. Three main beads represent the Three Treasures of Buddha, Dharma and Sangha, and other beads represent Buddha’s teachings to overcome each suffering of beings. Saisen or offering – Saisen is a practice of dana, an act of selfless giving and receiving. Service book – The service book contains the teaching and words of Buddha; therefore, it should be handled with respect. Shoko – The burning of incense should be done with reverence because it prepares us to receive the Dharma. It means to pay homage to Buddha and remind us of the law of impermanency of all things including ourselves. 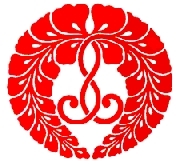 Wisteria crest (Kujo Sagarifuji No Mon) – The “Kujo-pendant-wisteria-crest” is the official crest of the Jodo Shinshu Honganji-ha. Originally the crest of the Kujo family, great Honganji patrons, the drooping blossoms suggest humility and sincere reverence to Amida Buddha. Every day we are surrounded by Amida’s light of Wisdom and Compassion. When we become aware of this light, there is no need to designate special days. However, we tend to forget the meaning of Buddhist history and, therefore, the observance of a special religious day sharply focuses our attention on some historic event or an important Buddhist practice and deepens our appreciation of our rich heritage. January 1 – New Year’s Day (Shusho-e) This is a day of dedication. With renewed resolution we dedicate ourselves to the way of the Nembutsu. February 15 – Nirvana Day (Nehan-e) On this day we solemnly observe the passing of Sakyamuni Buddha into Pari-nirvana. March 21 – Higan (Higan-e), meaning “other shore,” is a service conducted in spring on or about equinox day. At this time harmony rules throughout the universe. Therefore, we gather before the shrine of Amida Buddha to devote ourselves to the realization of this harmony in our inner lives. April 8 – Buddha Day (Hanamatsuri) This service is held to commemorate the birth of Gautama in Lumbini Garden. During the service a flower shrine known as Hanamido is set up in front of the main shrine as a symbol of Lumbini Garden. The sangha offers flowers and pours sweet tea over the image of the infant Buddha. September 23 – Higan (Higan-e) The sangha gathers twice a year during the spring and autumn to recall the practices of Six Paramitas. December 8 – Bodhi Day (Jodo-e) Gautama meditated under the Bodhi Tree (Tree of Enlightenment) and became a Buddha, perfect in Wisdom and Compassion. December 31 – New Year’s Eve (Joya-e) On New Year’s Eve we meditate on the countless blessings we have received throughout the year and express our gratitude to our parents, our nation, all beings, and Amida Buddha. January 16 – Shinran Shonin Memorial Day (Ho-on-ko), is a day of thanksgiving for the teachings, and is observed in memory of Shinran Shonin (May 21, 1173-Jan. 16, 1262) the founder of Jodo Shinshu and first to teach absolute faith in Amida Buddha. The Higashi (or East) Hongwanji observes the Ho-on-ko in November, following the lunar calendar. The BCA is associated primarily with the Nishi (or West) Hongwanji. May 21 – Shinran Shonin Day (Gotan-e) Shinran Shonin was born near Kyoto on May 21, 1173. On this day we observe his birth as the founder of Jodo Shinshu.